Following the recent exposé by EE Publishers on the deepening coal supply crisis facing Eskom, alarm bells are also sounding regarding the utility’s worsening generation plant performance impacting South Africa’s medium-term (five-year) system adequacy outlook. There are deepening concerns about the overall state of Eskom’s aging fleet of coal-fired power plants, and the ability of Eskom to meet demand in the next five years. Already, Eskom is operating its emergency open-cycle gas turbines in the Western Cape almost daily to meet demand and avoid load shedding. Compared to 2017, the energy availability factor (EAF) has significantly deteriorated from 78,61% in 2017 to 73,74% in the 2018 calendar year to date, and the EAF is likely to drop still lower in the summer months of 2018 ahead. Fig 1: Eskom week-on-week energy availability factor (EAF) for 2016, 2017 and 2018 to date. Unplanned plant breakdowns, as measured by the unplanned capability loss factor (UCLF), are significantly higher than expected, while planned maintenance outages remain high, as measured by the planned capability loss factor (PCLF). To a large extent this unhealthy situation has been mitigated by flat and declining electricity demand. Weekly demand, calculated from the aggregated hourly metered energy sent out (local generation plus imports), has been hovering around 30 GW for the last 8 weeks. If electricity demand picks up, there are likely to be supply constraints. The total energy sent out (TWh) in the 2018 calendar year to date, compared to the same period in 2017, is down by 0,37% to 155,87 TWh as at the end of week 36, 2018, while the peak winter demand for the 2018 year was 34276 MW – down 3,07% from the peak winter demand in 2017. Fig. 2: Week-on-week peak demand for 2017 and 2018 to date. 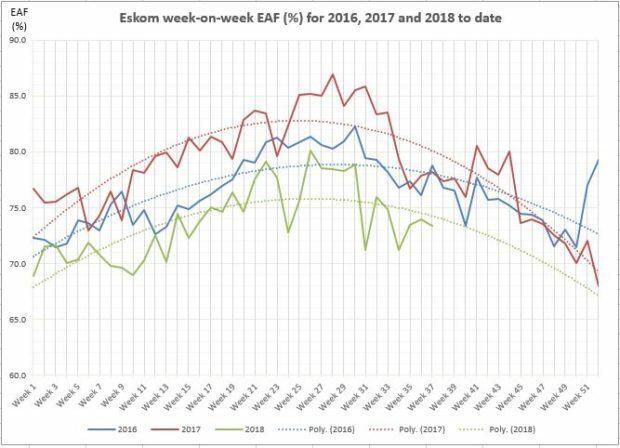 Eskom’s plant performance for the next five years to from 2019 to 2023, as measured by the energy availability factor (EAF), is forecast to range between 72% (pessimistic) and 78% (optimistic), with a declining trend in the latter half of the five year period. However the EAF currently sits at the lower end of the forecast band at 73,74%. 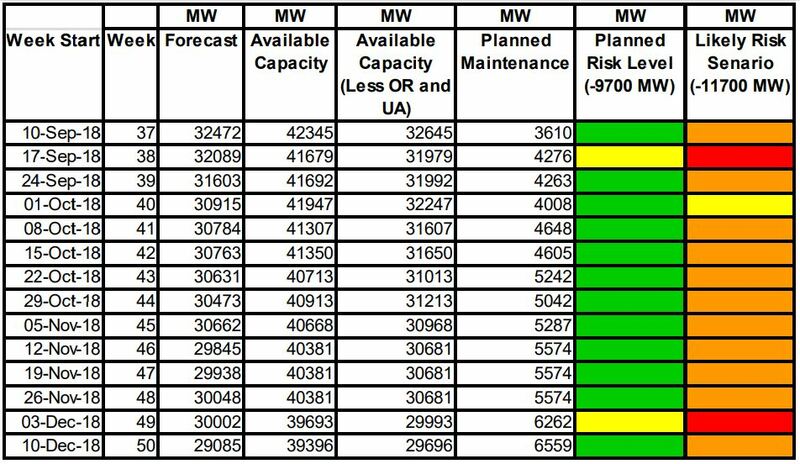 The likely risk of significant supply shortages of 1000 to 2000 MW to meet demand and reserves in the next three months is significantly worse than planned, as indicated in Fig. 3 (below). Green: Adequate generation to meet demand and reserves. Fig. 3: Weekly forecast demand vs. available generating capacity for next 3 months. Another issue Eskom still has to resolve is whether it will receive any further postponements of requirements for the utility’s coal-fired power stations to comply with the existing and new draft minimum air pollution emission legislation, regulations and standards beyond 2020. 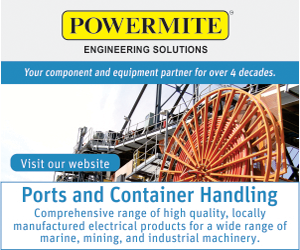 If not, this would add a new dimension to Eskom’s medium term operational, financial and environmental sustainability. It is becoming clearer to Eskom that the reality of declining coal-fired generation plant performance and the identified risks require urgent short- and medium-term interventions and deployments of new capacity. The situation is so volatile now that even the latest assumptions of plant performance in the Draft IPR 2018 are proving unrealistic. 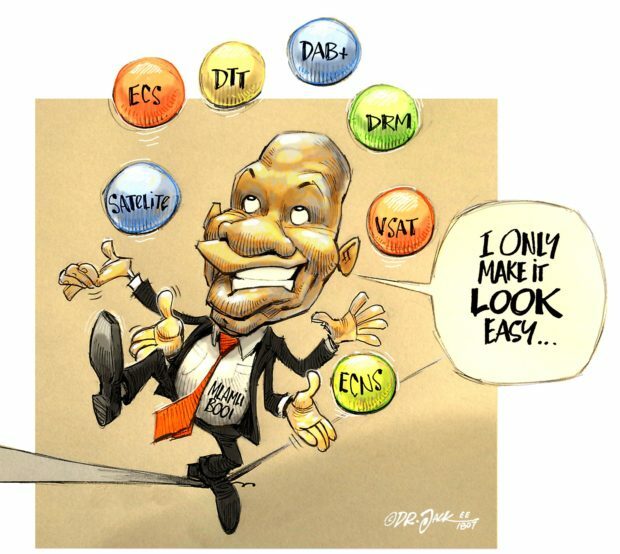 In terms of the System Operation Code of the South African Grid Code, Eskom publishes a Medium Term System Adequacy Outlook (MTSO) report on or before 30 October of each year on the adequacy of the generation system to meet the requirements of electricity consumers for the next five years. It is expected that Eskom’s 2018 MTSO will paint a very different picture to that of 2017 on the state of the generation system adequacy for the next five-year reporting period from 2019 to 2023, which informed electricity policy makers, stakeholders and customers are awaiting with considerable concern.